Hablamos Español & Falamos Português! It's always good to plan ahead. That's why we offer you a way to calculate your car loan in Cumberland RI. By using our loan payment calculator, you can decide which vehicle might work best for you. If you have questions on car loans in Cumberland above what the loan calculator can provide, then feel free to contact us at any time. By figuring out what the loan payment would be, you can get a better idea of what your monthly budget will be after you purchase a new or used car in Apollo Auto Sales. Leather * Moonroof * Alloy Wheels * Clean Autocheck * Heated Seats * Bluetooth Wireless * XM Satellite * Thank you for visiting another one of Apollo Auto Sales 's online listings! 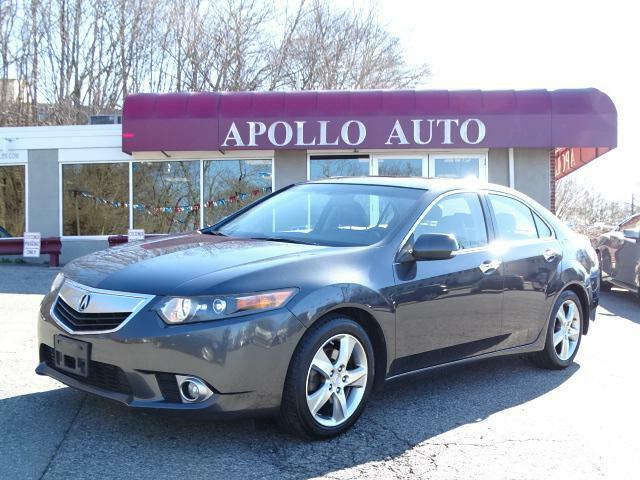 Please continue for more information on this 2012 Acura TSX with 118,466mi. This wonderfully fuel-efficient vehicle offers a supple ride, quick acceleration and superior styling without sacrificing MPGs. This is about the time when you're saying it is too good to be true, and let us be the one's to tell you, it is absolutely true. You can finally stop searching... You've found the one you've been looking for. More information about the 2012 Acura TSX: While the TSX is considered Acura's entry-level sedan, it lacks in neither performance nor luxury. The TSX's base MSRP price of just under $28,000 belies its well-equipped nature, as it offers a host of luxury and convenience items on all trims. The 2012 TSX holds its own against more expensive competition such as the BMW 3-Series and Mercedes-Benz C-Class. The Sport Wagon model takes all of the luxury and performance of the TSX sedan and adds cargo-carrying practicality. Interesting features of this model are aggressive styling, practical and fun sport wagon model, and Superior handling and acceleration Apollo Auto Sales has been in Business Since 1972. We Specialize in Late Model-Low Mileage-Fully Serviced Vehicles. Apollo Auto Sales practices a Velocity Based Pricing Strategy which provides a Transparent Sales Process and Excellent Overall Customer Experience. Please Call Us to Check Availability and to Schedule your No Hassle-No Obligation Test Drive!! Call 401-728-8998 or Click: www.apolloautosales.com.